Weaponized rabies and power-hungry politicians make for a deadly combination. Zombies roam the earth. Three families stand to lose everything. An obsessed megalomaniac dumps weaponized rabies around the globe creating the zombie apocalypse. As the cataclysm spreads, three families search for safety, or risk becoming part of the bloodbath. 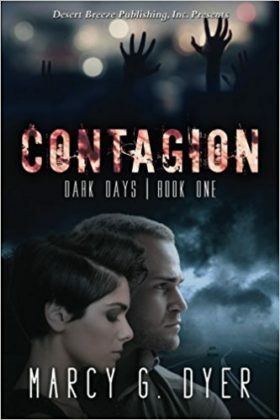 Randi Martinez, a carpenter hired to build a fortress in the Texas Hill Country, determines to take her family there when the infection ravages San Antonio. Will she find solace for her tortured soul if she can save her family? Scientist Reginald Barker and his family set out from Silver Penny, Colorado. He fights his way toward the Texas Hill Country to save his family and redeem himself for the chaos he created. Joshua Barker, an Austin Homicide Detective is determined to fulfill his responsibility to protect his brother, as he strives to reach his uncle’s home in the Hill Country. Book 1 of the Dark Days series.